There's no doubt that each service we arrange is different and unique but we understand that it is vital to be open and transparent about our prices. We provide an accurate, itemised estimate of costs at the outset when starting the funeral arrangement process. We are happy to arrange everything for you but are still happy to work hand in hand if that's what's required. We never ask for payment up front. Please call us to discuss the costs involved in a more elaborate service or to enquire about our 'Direct Cremation' package. 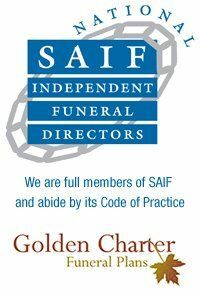 H Tredwin & Son Ltd are proud to recommend funeral plans from Golden Charter, the UK's leading independent funeral plan providers. More than 860,000 people in Great Britain have planned their funerals, over 260,000 of them with Golden Charter. Acceptance is guaranteed, regardless of age or state of health. If you would like to know more about the benefits of a funeral plan, contact us on 01823 672287 or visit us at 15 & 17 North Street, Wellington, TA21 8LX.